Everyone needs a hero, especially kids. When I found out my friend Gayle had breast cancer I was devastated. She was a school librarian that loved working with kids. Her concern centered around what her students might think as she lost her hair. I couldn’t believe how focused on others she was during this time of recovery. She bought wacky hats and fun clothes to wear. Gayle became my hero. 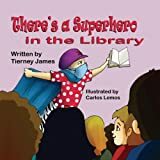 In spite of obstacles, Gayle recovered and is a walking miracle to those she works with each day and the children who think she’s a superhero in the library. I hope you enjoy this fun little book that offers hope. For ages 3-9… James loves Mrs. Bodenhammer, the school librarian. She introduced him to the magic of reading books. Then one day Mrs. Bodenhammer disappears. He discovers his beloved librarian has cancer. Even though he doesn’t understand how you get cancer James soon realizes it is serious. When the new librarian shows up with no hair and dressed like a superhero James has to decide whether or not to open his heart. Soon they become great friends and he decides this superhero is awesome. A surprise awaits James the day he hears Mrs. Bodenhammer will soon return having recovered from cancer. We rarely think about how our children are affected when their teacher becomes ill and unable to attend school. This light hearted tale of a little boy and the teacher he loves brings hope and joy in the scary world of cancer. James discovers that superheroes walk among us every day. Sometimes it’s just hard to see them.